Flavorful and super healthy packages of beta carotene, these bright patties have a hint of natural sweetness and are a great autumn mini dish. Preheat the oven to 375 degrees F and oil a regular 12-muffin pan. Bring a large pot of water to a boil. Boil the parsnips and carrots for 10 minutes. Drain, remove and shred or pulse in a food processor until very small pieces form. Sauté the onion in the oil until lightly browned. Add the scallions and cook another minute. Place the contents of the pan in a large bowl. Add the parsnip/carrot mixture to the onion mixture. Add in the flour, water, salt and pepper and mix until well combined. Press the mixture into the pan and drizzle or brush with 1/4 teaspoon olive oil. Bake 25 minutes or until lightly browned. Serve warm. These are fun to make – and a perfect dish that is ok to be messy and imperfect, which is perfect for kids to help with. Preheat the oven to 375 degrees F and oil a regular 12-muffin pan. Place 3-4 tortilla chips on the bottom of each cup and around the sides. The chips can be broken. Divide the refried beans and place in the middle of the chips. Sprinkle 2 teaspoons water over each cup. Divide and place the salsa over the cups. Squeeze the lime over each cup. Place 1-2 tablespoons of cheese on top. Bake 20 minutes or until lightly browned with crispy edges. Allow the cups to cool for a few minutes before carefully removing. Garnish with additional salsa, guacamole, lettuce and vegan sour cream if desired. Serve warm. 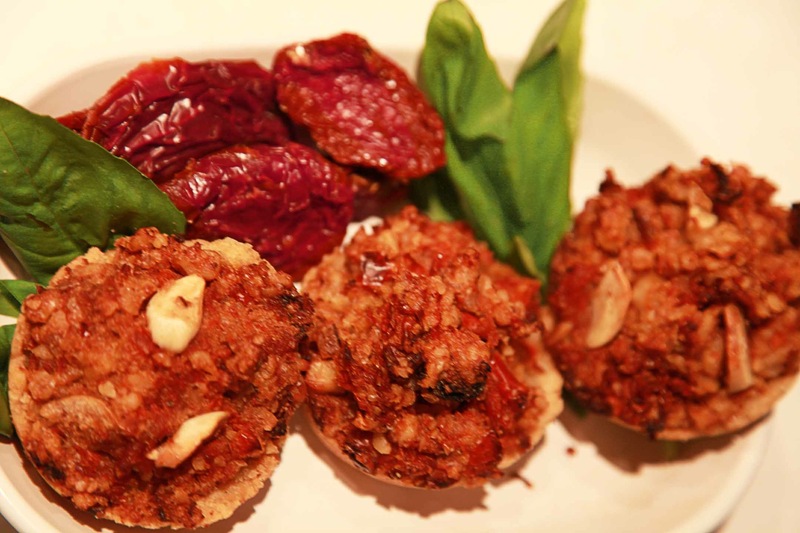 I love this hearty combination of flavorful sundried tomatoes with rich walnuts and fresh basil. The tahini ties it together, and, paired with salad, these make a nice lunch. Feel free to make extra drizzle to use over some fresh baby greens! Preheat the oven to 350 degrees F and oil a regular 12-muffin pan. To make the dough for the base, grind the oats in a blender or food processor. Combine the ground oats with the flours, baking powder, xanthan gum, baking soda, and salt. Add the butter and milk. Knead the mixture until integrated. Press the dough into the pan, forming a short ridge of about 1/4 inch up the sides. To make the filling, combine all of the filling ingredients in a blender or food processor and process until integrated and roughly ground. Distribute the filling evenly onto the base. Drizzle or brush 1/4 teaspoon of olive oil over each tart. Bake 25 minutes and garnish with additional strips of fresh basil. Serve warm with Tahini Drizzle either in a small bowl next to the tarts or drizzle it over the tarts. To make the tahini drizzle, combine all the ingredients in a blender and blend until smooth. Store refrigerated. 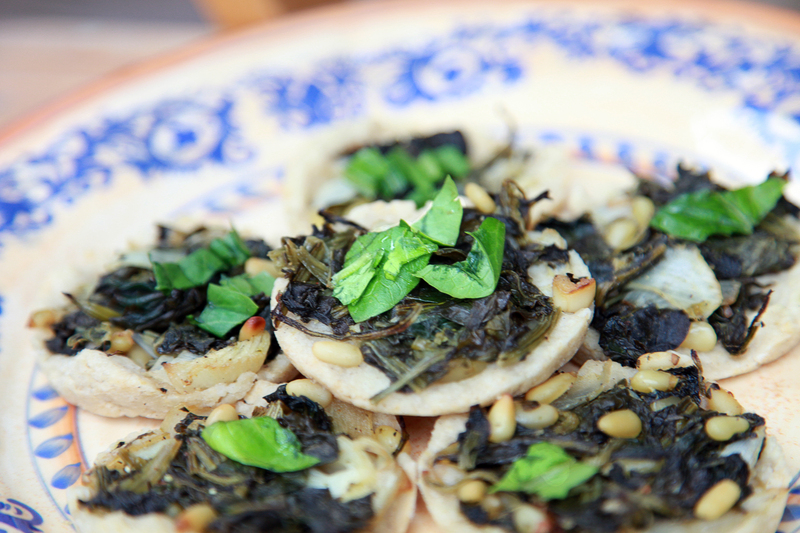 One of my favorite combinations, spinach and pignoli (pine nuts) is so hearty and filling, and full of iron, calcium, protein and other great nutrients. To make the filling, sauté the onion and garlic in the oil until they begin to brown lightly. Add the spinach, salt and spices and keep cooking until spinach is tender. Add the pignoli and lemon juice and cook one more minute. Set aside and make the base. Preheat the oven to 350 degrees F and oil a regular 12-muffin pan. To make the dough for the base, grind the oats in a blender or food processor. Combine the oats with the flours, baking powder, xanthan gum, baking soda, and salt. Add the butter and milk and knead the mixture until integrated. Press the dough into the pans, forming a short ridge of about 1/4 inch up the sides. Spoon the filling over the base. Bake for 25 minutes or until lightly brown. Serve warm. 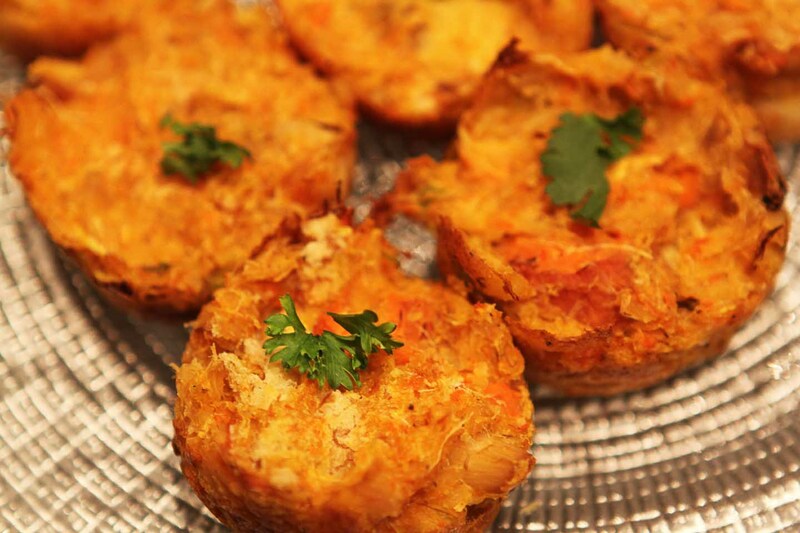 These delicate morsels are like mini souffles. You can cook the squash in advance if you want, by steaming, baking, or boiling it until tender, keeping it refrigerated until ready to use. Preheat the oven to 350 degrees F and oil a mini 12-muffin pan thoroughly. Blend all the ingredients together in a food processor or blender until smooth. Do not over blend. Spoon into the pan. 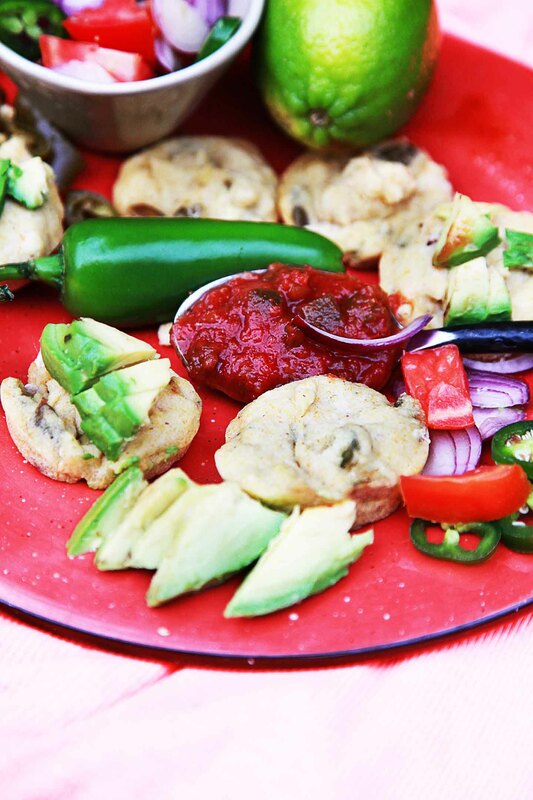 Sprinkle with additional cinnamon and drizzle with around 1/4 teaspoon of agave. Bake 35-37 minutes or until light brown. Let the tarts cool in the pan. Serve warm. Garnish with powdered sugar if desired. 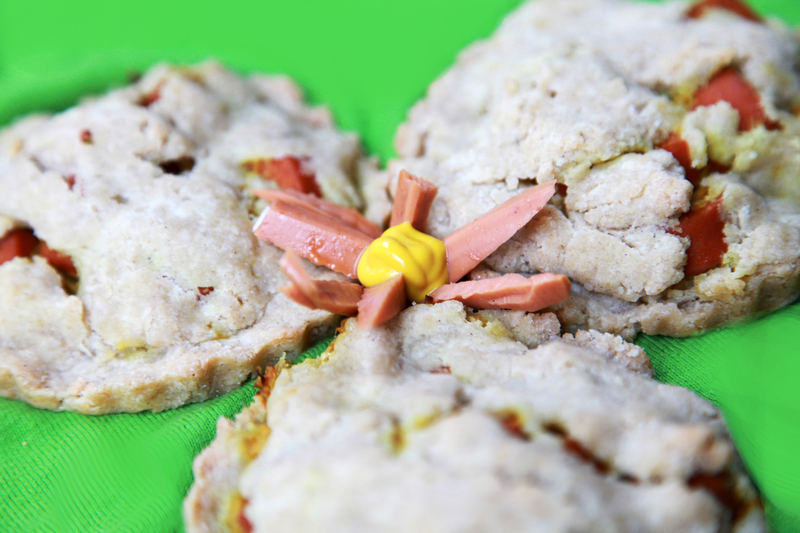 Kids love these adorable hot dog pies! There are a few varieties of vegan hot dogs that are gluten-free, make sure you check the labels to be sure. Preheat the oven to 350 degrees F and oil 6 4 inch tartlet pans. To make the dough, combine the flours, baking powder, salt, xanthan gum and baking soda in a bowl. In a separate bowl, beat the cream cheese, butter and milk until smooth. Knead the two mixtures together until just combined. To make the filling, sauté the hot dogs in the olive oil. Combine the mixture with the sauerkraut and mustard in a bowl. Form 12 balls out of the dough. Roll to about 1/6 inch thick circles. Press a circle into each tart pan. Place about 3 tablespoons of filling into each tart. Place another round of dough over each and press to seal. Bake for 30 minutes or until lightly brown. Serve warm. 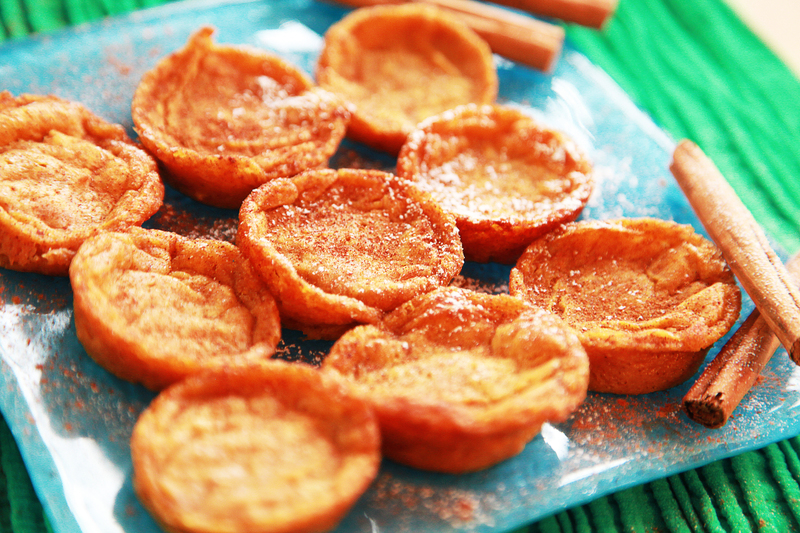 Make a Mexican fiesta out of these tarts! To make the tarts, preheat the oven to 350 degrees F and oil a regular 12-muffin pan. Combine the flours, baking powder, xanthan gum, salt and baking soda in a bowl. Stir in the milk and oil. Fold in the black beans, pumpkin seeds and hot peppers. Bake 20 minutes. To make the topping, combine all the ingredients in a bowl. Spoon onto the tarts and serve immediately.